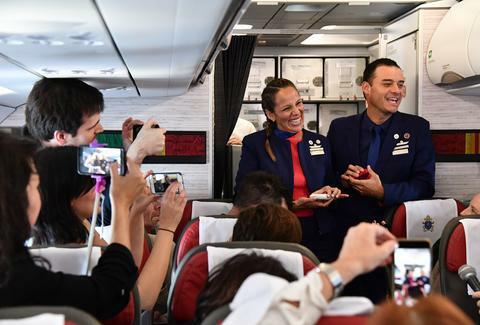 No matter how much time, energy, and cold hard cash you pour into your wedding plans, it's tough to imagine you'll ever be able to outdo the impromptu marriage ceremony that took place in the skies over Chile on Thursday morning. That is, unless you too can convince Pope Francis to spontaneously officiate the whole thing aboard his jet in mid-air. While posing with the pontiff and the rest of the crew for an official picture before departing Santiago for Iquique, Chile, flight attendants Carlos Ciuffardi and Paola Podest -- a couple of over 10 years who met while working for Chilean airline LATAM -- were asked by the pope if they were married. They explained that they'd been civilly married since 2010, but hadn't been married in the church yet because days before they were scheduled to, an earthquake destroyed the church where they planned to wed. Then the Pope popped the question: Would they like him to marry them right then and there on the plane? So, as the papal plane was wheels-up to Iquique, the leader of the Catholic Church performed a brief ceremony while an airline executive serviced as the official witness and a hand-drafted license was signed by a Chilean bishop also onboard. It was the first time any couple had ever been married by a pope on a plane. Francis also gave them each a wedding gift: a white rosary for the bride, and a black one for the groom. "He held our hands, blessed the rings, and he married us in the name of God," Ciufardi said, according to a report from CruxNow.com. Afterward, Podest acknowledged she was "still in shock" while answering questions from journalists. The couple said they plan to celebrate by enjoying a "tiny honeymoon" in Iquique, where the Pope was traveling to hold a large outdoor mass, on Thursday night before returning to their home in Santiago on Friday.